Isn’t this a Modus Operandi all too redollent of banking practices of charlatans as commented on by Duncan Bannantyne in respect of the odious pond life and insecure little Hamish Grossart – a style of corruption most likely learned from his odious uncle Sir Angus Grossart? Strange to note that Angus Grossart was a Director of RBS, yet surely being in a dubious ethical position as the owner of his own bank – Noble Grossart and association with undeniably corrupt politicians aand seemingly an advocate and proponent of Satanism in that the décor of his bedrooms represent the 7 deadly sins and his choice for the 8th. Whilst spending public money displaying Satanic symbolism as the new layout of St Andrew Square in Edinborough. Would it be unrealistic to hope that what seems to be a corrupt and corrupting mafiosi in the banking world of the Grossarts so well sheltered by soft loans of other peoples’ money and membership of The Spec to ensure association with those who can support them! Is this a structure of mutual self service, founded on dubious practice? 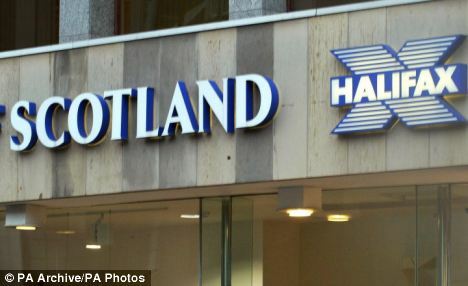 Police investigating a suspected giant fraud at an office of Bank of Scotland, now owned by Lloyds Banking Group, expect to make more arrests within days. Six people were arrested by Thames Valley Police last year during the investigation into claims that the branch in Reading, Berkshire, stipulated that some of its business clients would have to use an advisory firm to be eligible for fresh funding. However, the fees imposed on the companies by Quayside, a business consultancy, were so large that they crippled several firms, which were then put into administration. A group of directors who lost their businesses in the affair have written to Lloyds and previously HBOS demanding an investigation. Although the requests have yet to be met, Lloyds confirmed in April that it was talking to lawyers representing the directors, who are now considering bringing legal action against the bank. Paul and Nikki Turner, directors of music publisher Zenith Cafe, are part of the group of 21 directors. Last week they received a bank statement from Lloyds revealing that Zenith’s overdraft had increased from £9,419 in April 2008 to £564,438 in October 2010. The statement showed more than £300,000 of withdrawals, which were paid to law firm Denton Wilde Sapte, now called SNR Denton. Lloyds Banking Group declined to comment on the issue and SNR Denton could not be reached for comment. Previous Previous post: #G0485* – Bill The Kid’s Greatest Heist!!! Next Next post: #G0487* – SALT TO TASTE Is NOT The Only Answer!